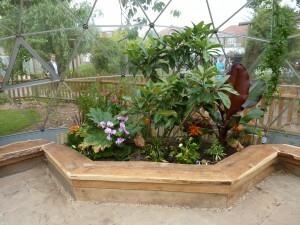 Solardome is supporting Hayes Park Primary School’s fund raising initiative to create rainforest eco-dome. Solardome Industries, Southampton, UK, will be attending the grand opening of Hayes Park Primary School’s Solardome® rainforest eco dome on Wednesday 26 June at 1.30pm. It will be opened by The Worshipful the Mayor and Mayoress of Hillingdon, Councillor Allan Kauffman and Mrs Lynne Kauffman, and attended by members of the school’s Eco Council, parents, teachers, other local schools and members of the Groundwork Trust, and local ward councillors. Their SOLARDOME® Vega, which was delivered in May 2012 represents several years of planning and fundraising, but their fundraising efforts haven’t stopped there. Whilst they have the dome with seating and some planting, their vision of creating a truly tropical environment to inspire pupils is still at work. Events including Green Week, Bags2School, recycling initiatives and donations from Nestle, Tesco and the Mayor’s Fund have all helped raise much needed funds, but it continues. The dome is already inspiring pupils and bringing the community together. The new rainforest eco dome centres on a beautiful mosaic designed and created by students and local artist Christine Smith. A pond has been created and banana trees, a lemon tree and a host of tropical flora are all thriving in the perfect conditions. Children are also getting hands-on with growing their own peppers, melons, chillies, tomatoes and other crops. The school’s passionate fundraising drive continues in order for their vision to be fully realised – a stunning rainforest for the children of Hayes Park School and the surrounding area to be part of, be inspired by and enjoy.